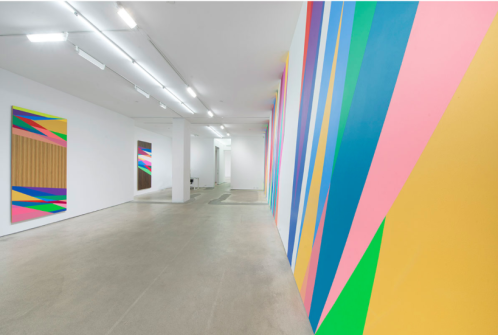 Jack Shainman Gallery is currently hosting an Odili Donald Odita exhibition. 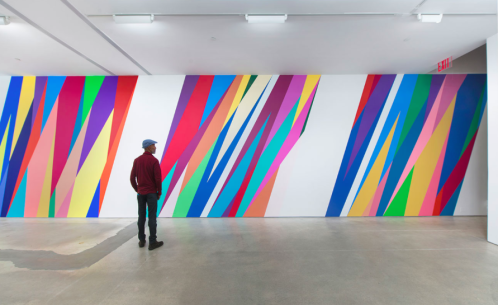 Through geometrical realms of forms he explores the plurality of colors. With ‘The Velocity of Change’ the African artist presents a show that goes beyond the formality of language. Deep blues, reds, pinks, grey and yellows in different tones and shades compose the artworks of The Velocity of Change. They separate the canvas while binding together in a calculated manner. By doing so Odita interrogates the process of language by creating works free of constructions and full of possibilities. He defines the ‘faulty thinking’ contained in language that ‘can be used to terrorize, vilify, cannibalize, ostracize, persecute and subjugate others who are not in the same space of authority.’ Therefore to counter this scheme he uses colors to escape pre made definition and free imagination.